To practise question words and structures you should try 'Up Side Down Quiz' with your students.Working in groups children will feel comfortable to speak and have fun. All you need to do this activity is a sheet of paper for each group and pencils. 1. Divide the class into groups of four. 2. 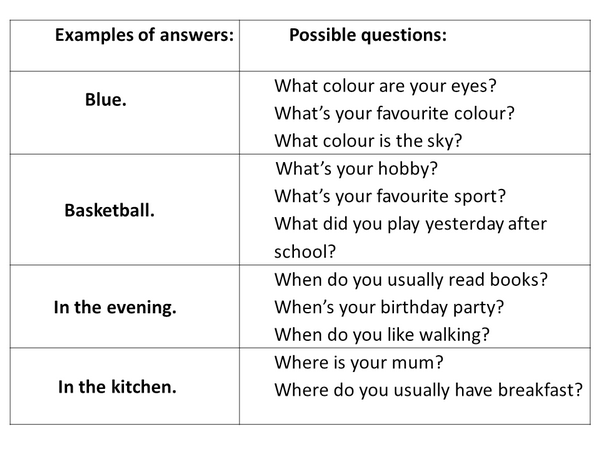 Give the answer and each group has to make a correct question and write it down. 3. Each correct question gives a point to a team. - Before starting the activity you can ask students to prepare some answers, write them on stripes of paper and put them into a small bag or box. Then you can use them during the quiz. - At the beginning of the activity revise question words and write them on the board. To find more speaking activities for young learners, click here.